Back on the promo trail for the final season of the 'Game of Thornes', Maisie Williams and Sophie Turner posed together on the red carpet at the Belfast, England premiere this evening(April 12th). 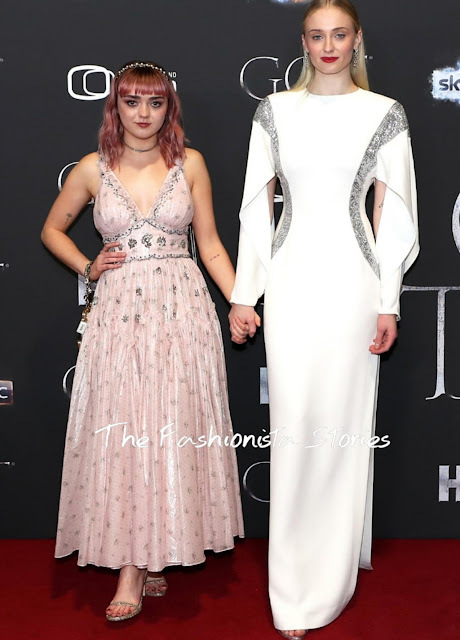 Maisie Williams wore a custom COACH blush pink cotton lamé, prairie tea length gown with vintage crystal and sequin hand embellishment. She also carried a Coach Mini Double Frame bag, which is an archival-inspired handbag, made with metallic nappa leather with embroidered embellishments and metallic tea rose application, chain handle with charms and a personalized hangtag with Williams’ initials. Sophie Turner of course wore a custom look courtesy of LOUIS VUITTON. I really like this white and silver beaded panel dress on her, which featured split sleeves and a side slit. She was easily my favorite here. A complimentary beauty look and diamond earrings rounded out her look.